I shrugged again, finally earning a little scowl, which somehow made the girl even more pretty. It brought a bloom to her pale cheeks and made sharp shelves of her cheekbones. I gestured for my journal, but she still wouldn’t give it to me. So I took out my pen and wrote I can’t on my palm. Then, in tiny letters below it, I finished the thought: Now don’t you feel like a jerk? Tommy Wallach's first book 'We All Looked Up' was one of my favourite books of last year. I loved how it united all walks of life, so when I saw his next novel had come out I bought it without even reading the synopsis and started to read it straight away. The plot for this book is a bit all over the place, I think the point of the synopsis is to intrigue you while also completely throwing you off what the book is really about. And I don't understand why because I could think of a million and one better ways to sell this book that what they have done. Any way that is not the point of the review. 'Thanks for the Trouble' is about Zelda and Parker, who meet at a hotel after Parker tries to rob her. Zelda tells Parker she is going to kill herself by jumping off the golden bridge and Parker tries to tell her that there are more things in life left to live for. That's the main plot of the book but sometimes it went quite off track and added in extras that where definitely not needed. The characters in this book where great, each very individual and unique but still 'realistic'. My favourite character was Alana, she was super spunky and a bit of a nerd but still had a social life, which most authors don't add to a nerdy character. 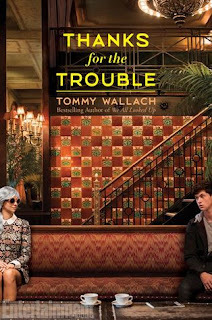 Tommy Wallach is amazing at character building I obviously knew this from 'We All Looked Up' but he blew me away once again with his incredible characters. I loved how the book was written. I had never read a book that was written as a college essay and I loved it. If anyone has any other books written similarly to this one please tell me. It was great how he manage to break the fourth wall while still making it part of the story. The ending was the best part of the book. It left you feeling like the book had really given you something. The way nothing changed yet everything changed and he summed it up so perfectly in the last paragraph or two. In conclusion, 'Thanks for the Trouble' wasn't as spectacular as 'We All Looked Up'. It was still a great read that made you think about who you let into your life and how we shape other people. I will be buying/reading his next book for sure. I'm giving this book 3/5.